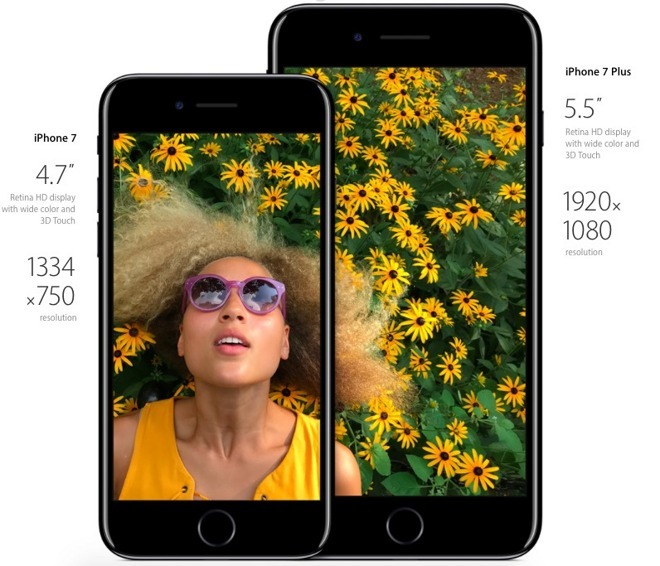 Apple's latest iPhone 7 and 7 Plus are faster, sport significantly better cameras, expand system-wide haptics in iOS 10 with a new solid state Home button and Taptic Engine, introduce Wide Color and other major Retina HD technology improvements without changing their display resolutions, add new water resistance and include updates to system components ranging from RAM to storage to wireless capabilities. 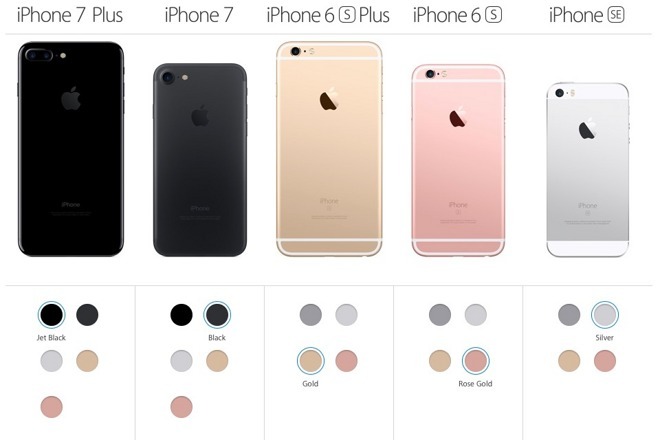 iPhone 7 models deliver six major categories of enhancements over Apple's iPhone 6/6s (the world's top selling smartphones): a newly harmonized Home button and 3D Touch haptic user interface paired with an enhanced Taptic Engine actuator; Wide Color Retina HD Display; a significantly improved A10 Fusion Application Processor providing enhanced speed and efficiency, paired with 2 or 3GB of RAM and larger batteries for an extra hour or two of use; new rear and FaceTime cameras and lenses with Optical Image Stabilization for more detailed low light photos and smoother video; louder new stereo speakers paired with Lightning and wireless audio and enhanced wireless connectivity that supports faster, feature-enhanced LTE Advanced mobile and MIMO WiFi; and new iP67 dust and liquid intrusion resistance. The new 7 and 7 Plus models continue to sell alongside last year's 6s/6s Plus, which are now $100 less (starting at $550), as well as the A9-powered, 4 inch iPhone SE, which starts at $399, Apple's least expensive iPhone ever, despite its modern processor and camera technology refresh earlier this year. 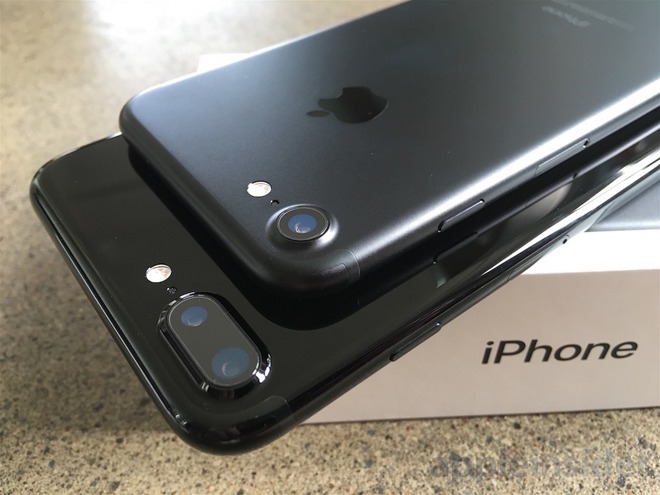 In addition to their new features, iPhone 7 and 7 Plus also stand apart as the only models offering 256GB capacities (iPhone 6s models are available in 32 and 128GB versions, while iPhone SE is sold in 16GB and 64GB versions), and are Apple's only handsets currently offered in the new Black or Jet Black finishes. Since giving its eighth generation iPhone 6 models larger and higher resolution Retina HD Displays two years ago, Apple has focused on enhancing its display quality and the usability of multitouch rather than simply bumping up pixel count and screen size, as its competitors have been doing at regular intervals (while tacking on forgettable, dead end gimmicks as 3D stereoscopic displays and banana-curved screens). Last year, Apple's 3D Touch introduced navigation shortcuts (with app Quick Actions) and an added dimension to multitouch gestures (including Peek and Pop, iOS' 3D Touch equivalent to the keyboard-invoked QuickLook and document launching on the Mac). Given that most iPhone 7 buyers are upgrading from iPhone 6 or older models, or are cashing in their Note 7 recall check or otherwise switching from Android, 3D Touch remains a key new feature of interest on this year's new iPhone models. Resembling Force Touch on Apple Watch, iPhone 3D Touch similarly employs a "Taptic Engine" to deliver haptic feedback--literally touch sensations--delivered by a precision vibration actuator (a linear induction motor that drives a payload back and forth using electromagnets, with the accuracy of a high fidelity speaker coil). Over the past decade, Apple has increasingly expanded its use of vibration, starting out just as a crude way to deliver a quieter alternative to a ringing telephone. As a pioneer in accessibility, Apple has applied increasingly sophisticated vibration feedback hardware and software to assist users who can't hear audio feedback, or who are guided by touch rather than sight. Last year, Apple brought its haptic accessibility technology to mainstream users by designing its new 3D Touch to literally strike a nerve in pairing it with sophisticated and emotive Taptic Engine feedback. However, it seemed Apple was hard pressed to evoke much excitement for the new interface concept, perhaps largely due to the fact that it was so conservatively rolled out. Apart from enabling Peek and Pop for attachments and some sporadic apps supporting Quick Actions, 3D Touch didn't seem to do a whole lot. More often than not, experimenting with 3D Touch seemed to lead to the embarrassment of "what are you trying to do, silly human?" rather than the sort of delightful, rewarding feedback afforded by the direct manipulation interface introduced by the Macintosh, or the novel magic of multitouch on the first iPhone. Apple's 3D Touch wasn't just a feature thrown out to get some attention--it was the first step in a long term strategy. However, unlike the gimmicky, flameout failures of Samsung's hand waving navigation or Google's Android face unlock or Amazon's face tilting parallax on the original Fire Phone (or the shockingly bad 3D Burns interface of the Galaxy Note 7), Apple's 3D Touch wasn't just a feature thrown out to get some attention--it was the first step in a long term strategy. The new iOS 10 greatly expands the applications of 3D Touch as part of a continuum involving variable multitouch input and haptic feedback. There was once a time when adding sound effect feedback to the graphical UI of desktop computers was a novel idea. Similarly, haptic vibrations provide a layer of subtle skin feedback that can make touching a hard flat screen as familiar, emotive and intuitive as interacting with an organic being or manipulating a mechanical device. The new iPhone 7 models get a bigger Taptic Engine capable of providing both more precise and more intense haptic feedback. This is not only used to reinforce 3D Touch gestures. In iOS 10, the system expands the use of haptics so much that audio settings are now labeled as "Sounds and Haptics." Now activated by default in iOS 10, System Haptics provides subtle tap feedback for "system controls and interactions," including when you turn a virtual switch on or off. 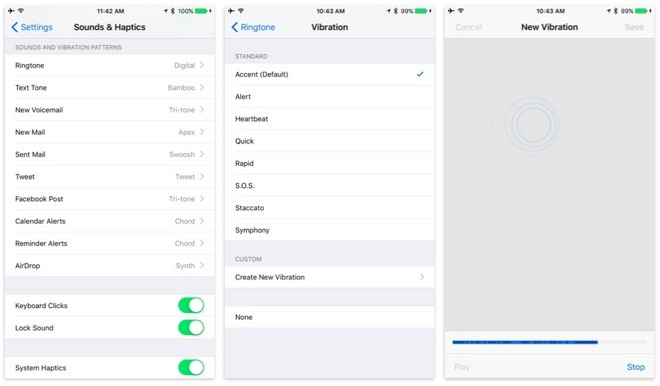 Additionally, iOS 10 allows you to assign various system events (an incoming call, new email, AirDrop, reminder alerts) not just an audio alert (dings, boops and bleeps) or ringtone (short sequences of notes or other sound effects), but a custom vibration--ranging from a basic buzz to the more incessant "Rapid," an SOS signal or a half dozen other preprogrammed haptic sequences. You can also make up your own vibration--basically a silent haptic ringtone--by tapping out a sequence. You can also assign a custom haptic vibration to a contact, so that when your lover calls, you are alerted with your own person tap sequence evoking Whitney Houston's I wanna dance with somebody (who loves me). and iPhone 7/7 Plus product specs. Conversely, you can also send that sort of haptic message in iOS 10's new Digital Touch within iMessages, which now works like Apple Watch to send tap sequences. Oddly enough, while Digital Touch taps and heartbeats deliver with haptic feedback to Apple Watch, they only show up as visuals on iPhone 7 (or other iOS devices). If you're set to silent, you get a haptic alert of an incoming message, but you don't feel the taps or heartbeats, and there's no haptic reinforcement of fireballs or kisses or broken hearts. This seems oddly inconsistent. Another curious omission, given Apple's focus on haptics, is that there's no option for adding haptic feedback to the virtual keyboard as you type. There's a couple reasons why this might be intentional--first off, subtle haptics can quickly grow excessive when over-applied. Getting feedback on a setting change seems a lot more useful than having a constant rumble from the keypad distracting you as you type. Also, we already know how to type on glass, so adding haptic taps would not only feel excessive and foreign, but would also distract attention from meaningful incoming haptic alerts. 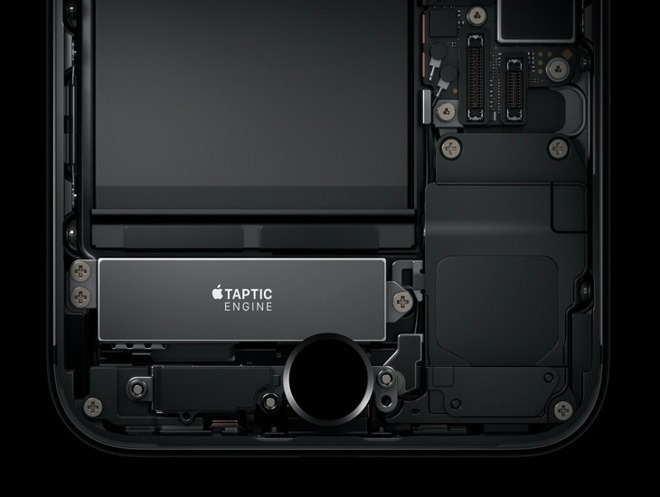 Finally, the Taptic Engine uses electricity, so if it's constantly running, that could end up significantly draining the battery. 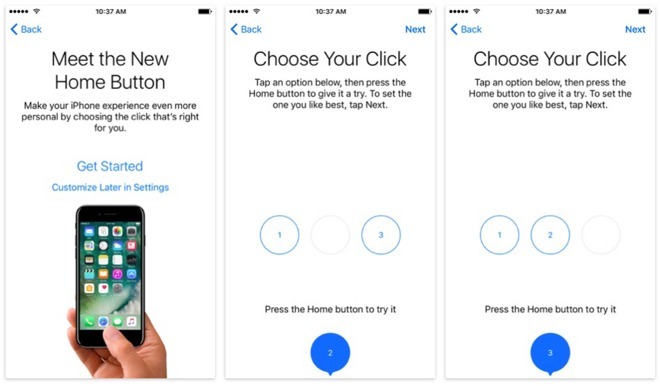 The haptic-backed 3D Touch introduced last year is now also making its way into the new solid state Home button in iPhone 7. Just like Force Touch on the Retina MacBook, the newest iPhones make use of the Taptic Engine to deliver haptic feedback that stands in for the physical click of former mechanical Home buttons. This takes a little getting used to, and feels a bit synthetic. The effect is adjustable to one of three levels of intensity in Settings, and this preference is one of the options Apple presents when you first set up a new iPhone 7. Moving to the new non-mechanical Home button has some historical parallels, including Apple's shift from a mechanical Click Wheel on the first iPod to a solid state, capacitative Touch Wheel that contributed to the product's durability. Moving parts are generally among the weakest links on electronic devices. The original iPhone similarly transitioned smartphone users from physical keyboards to its new multitouch virtual keyboard on the screen. Critics originally complained that the new iPhone was "kind of trending against what people are really liking in phones nowadays, which are those little keypads - the BlackJack from Samsung, the BlackBerry obviously," as John Dvorak opined at the time. Dvorak, writing for economic bellwether Marketwatch, recommended shorting Apple stock in June 2007 back when it was under $20 per share (split adjusted), due to the idea that users would return iPhones "in droves" to buy something with a physical keyboard. Apple (and its stock, up over 550 percent) ended up going the opposite direction, incrementally eliminating one mechanical component after the other from its computers every since: optical drives, spinning hard disks, MacBook trackpads and now the iPhone Home button. In addition to eliminating a fragile part (recall when people were complaining that Touch ID stopped working after unauthorized repairs of broken Home buttons? ), the new Home button also makes it easier to achieve dust and liquid intrusion resistance, as discussed later in this review. The primary downside to the move toward haptics and 3D Touch was that the new layer of digitizer sophistication added some weight and a slight increase in thickness to the phone. The new iPhone 7 models are unchanged in their physical size compared to iPhone 6s, and are actually slightly lighter. The standard iPhone 7 weighs 4.87 ounces (138 grams) compared to the 5.04oz (143g) iPhone 6s, while iPhone 7 Plus weighs 6.63oz (188g) vs 6.77oz (192g). While other dimensions haven't changed, old covers won't work on the new models unless you cut out a new hole for the larger and repositioned camera bumps. You can check out Apple's latest cover colors at the bottom of this review. While a lot of work has gone into making 3D Touch smart, useful but unobtrusively inconspicuous, Apple has greatly enhanced the visible characteristics of its iPhone 7 Retina HD displays. Back in May, Apple's chief executive Tim Cook said in a TV interview, "we have great innovation in the pipeline, like new iPhones that will incent you--and other people that have iPhones today--to upgrade to new iPhones. We are going to give you things that you can't live without, that you just don't even know you need today. You will look back and wonder 'how did I live without this?'" While pundits blew off his comments and groused about how boring iPhone 7 was definitely going to be, Cook's comments were likely made with (among other things) the appeal of the iPhone 7's new Retina HD displays with support for Wide Color in mind. They're that good. Once you see it, its one of the things you don't want to have to live without anymore. Both iPhone 7 and 7 Plus feature radically enhanced displays with very high contrast ratios, very low reflectance and peak brightness levels above 700 nits. DisplayMate rated the new iPhone 7 Retina HD panels as "most color accurate display that we have ever measured." The displays on both models--as well as their cameras--also now support Wide Color as defined by the Digital Cinema Initiatives P3 color gamut specification. This extra color information isn't visible on most of today's PCs, notebooks, tablets or phones, but is of course displayed by iPhone 7 and 7 Plus (as well as Apple's 5K iMac and 9.7" iPad Pro). This makes it particularly strange that several reviewers, including Niley Patel for the Verge, talked about comparing iPhone 7 photos on "a laptop" and not seeing any real difference over previous iPhones. Imagine a videophile website reviewing a bootleg DVD copy of a 4K Wide Color Gamut Ultra HD Blu-ray and announcing that there's no apparent increase in quality over other DVDs. "I took a few photos with the iPhone 7 Plus and the iPhone 6S Plus under decent light and asked people to tell them apart on a laptop screen," Patel wrote. "It was pretty hard for most everyone, although the 7 definitely has more vibrant colors and a noticeably shallower depth of field because of the brighter lens. You can tell if you know what to look for, but the difference in most shots will be imperceptible in an Instagram or Facebook feed." Apple doesn't yet sell any laptops with support for P3 Wide Color. Even stranger, Apple brought representatives from Facebook's Instagram group on stage at the launch event to address the company's plans to adopt DCI-P3 specifically for sharing Wide Color photos captured by iPhone 7. Writing for Consumer Reports, Terry Sullivan also preliminarily reported that "the new phones seemed to perform no better than the iPhone 6s for still photos." In part, that may be because some reviewers don't know what they're not seeing. In the future, Wide Color will come to HDTVs and all modern Macs and iPads, so capturing your photos from 2016 with this expanded color palette means you'll have more vibrant memories of your kids, sunsets, travel photos and whatever else you like to take pictures of, even if many people today lack the capability to actually see the P3 gamut outside of iPhone 7 screens. 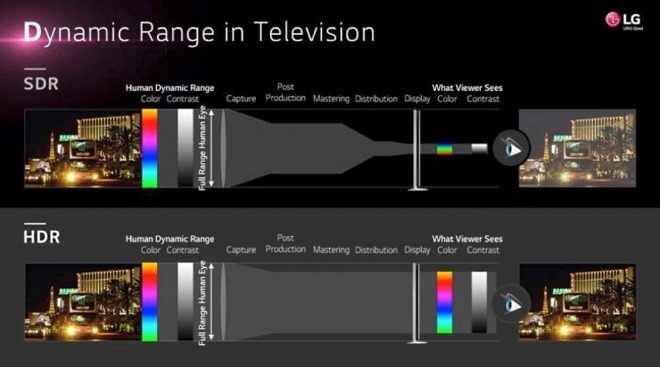 Wide Color Gamut is part of what TV vendors are branding as "High Dynamic Range"
It's hard to express how much better Wide Color images look, and unless you have one of the latest screens Apple has shipped, this web page can't even show you the difference. You have to see it in person on a Wide Color-equipped display. It's also hard to distinguish the difference attributable to Wide Color reproduction versus the superior brightness, color and contrast of the new iPhone 7 displays. While they're still LCD panels, they appear to perform more like the AMOLED technology used in Apple Watch: deeper and richer, with a color intensity that makes bright colors really pop. Even the quite new iPhone 6s display looks drab and flat next to the newest iPhone 7 screens. Apple's efforts to enhance the overall qualitative performance of its iPhone 7 displays stands in contrast to Android and Windows Mobile flagships touting absurdly high resolutions. Nothing has changed in the pixel count or screen sizes of the two new iPhone 7 models. The Retina HD display of the 4.7-inch iPhone 7 retains a 1334-by-750 or "1 megapixel" resolution (a quarter million more pixels than iPhone SE's 727,040, at the same 326ppi pixel density as the SE and 6s), while the Retina HD display of the 5.5-inch iPhone 7 Plus retains a 1920-by-1080 or "2 megapixel" resolution (at the same 401ppi pixel density as last year's 6s Plus). Virtually all of Apple's rivals have been promoting larger and higher resolution screens. A long list of flagship Android and Windows Mobile phones ship with 2560-by-1440 resolutions, apparently just because these "Quad HD," 3.6 megapixel panels exist. Adding more pixels (whether on a larger screen, or simply contributing toward greater pixel density) may seem like an incremental no-brainer feature, because sharper displays should always look better. However, there actually is a major downside to the high pixel counts of devices like Samsung's Galaxy Note line or Google's Nexus 6P. With nearly 3.7 megapixels, these displays demand far more graphics and CPU processing power to feel as responsive as an iPhone with nearly half or almost a quarter of the pixels. Back in 2014, we noted that even iPhone 6 Plus took a significant performance hit compared to the similarly A8-powered iPhone 6, apparently due entirely to its extra million pixels. Apple's A8 was already faster than the best chips Samsung and other Android licensees use. By continuing to ramp up pixel counts while relying on less performant Application Processors, Android players are doubling down on their failing strategy of optimizing for specs rather than real world usability. We'd like to update the GPU performance numbers for the latest 2016 phones, but it appears that the current graphics benchmarks don't yet support the latest hardware. So that will come in a followup report. However, over the last two years of iPhone 6 and 6s sales, the outcome of these two different approaches makes it clear--without even considering benchmark specs--that an increasing small population of users are choosing to pay a premium for oversized, resolution-maxed Android models while mainstream users are looking beyond screen specs and instead picking a phone with a high quality screen backed up by a sufficiently fast processor, which is also capable of running the best apps. 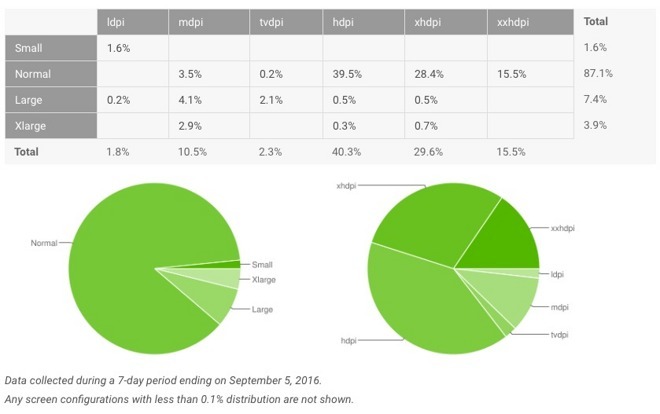 According to Google's Developer Dashboards, over 87 percent of Android's installed base still opts to use "Normal" screens (less than around 5 inches), rather than "Large" or "Xlarge" models, and only 15.5 percent are using devices with an "xxhdpi" screen, which the company loosely defines as somewhere greater than about 250 dpi. Those figures haven't appreciably changed in the last year. So while Google and its Android partners showboat their huge flagships, the reality is that most buyers are opting for cheap, low end Androids or high end iPhones (as the overwhelming majority of new iPhones sold each year are Apple's latest model). Two years ago, there was increasing evidence that a relatively small but collectively significant number of buyers were demanding larger screens than Apple was offering in its 4 inch iPhone 5 family. Apple capitalized upon that interest with iPhone 6 and 6 Plus, which eviscerated Android's high end sales, particularly those of Samsung. However, it currently does not appear there's much demand for ultra high resolutions or even larger screens than those Apple is now selling. As we correctly predicted last year, "Apple is unlikely to radically change its displays next year. Instead, it appears Apple will continue to focus on its performance edge with increasingly fast silicon and more sophisticated software driving its Retina HD screens." Incrementally improving the current format is also of benefit to Apple's iOS developers, who can focus on their own software rather than optimizing for new fragmented categories of screen sizes and resolutions. The general absence of changes in the size and UI features of iPhone 7 and 7 Plus also indicate that Apple is happy with its reception for the two models, and also that it believes that demand for the smaller 4 inch iPhone SE can be met with a single model. There's no new bigger model but also new smaller iPhone either. Apple's first foray into large screen smartphones--the original iPhone 6 Plus--was not one of those legendarily bad "1.0" devices that pundits love to direly warn users never to even consider buying. Customer satisfaction ratings for the 6 Plus were remarkably high, even by Apple's standards. That didn't mean it couldn't be improved upon, however. Last year, Apple gave both the 6s and 6s Plus a big boost in processor power with the A9 Application Processor. Apple claimed a 70 percent increase in CPU speed (almost 3x the 25 percent increase of the previous year's A8 over the A7) and a 90 percent increase in GPU power (almost twice the A8's 50 percent improvement) for its third generation of 64-bit iOS silicon. 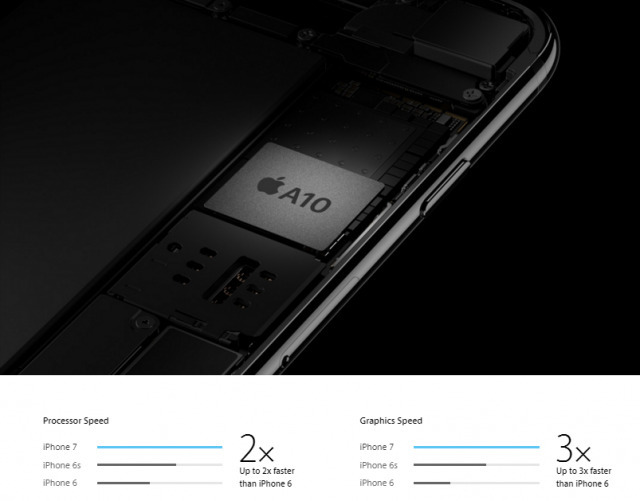 This year, Apple's new A10 Fusion Application Processor boasts up to a 40 percent leap in CPU power over last year's A9 (Apple promotes its as being up to 2x as fast as the original iPhone 6, which is what more people will be upgrading from) and says its GPU is up to 50 percent faster (again, Apple cites an up to 3x improvement over iPhone 6). Our benchmarking of iPhone 7 and iPhone 7 Plus models in Geekbench 4 reflected Apple's 40 percent increase claim over the previous generation A9. The new A10 Fusion also outpaced last year's iPad Pro with its beast A9X chip, and even beat the single core performance of the Intel Core m7-6Y75 used in Apple's Early 2016 Retina MacBook (although chip still retains an edge in dual core performance). The A7, A8, A9 and A10 Fusion suggest Apple is maintaining an Intel-like tick-tock cadence where odd year A-series chips jump in performance, and even numbered generations focus more on efficiency. In fact, Apple has focused major emphasis on its newest chip's increased efficiency, which is alluded to in its "Fusion" branding. Similar in concept to the big.LITTLE ARM architecture, Apple's custom ARM implementation uses two sets of CPU processor cores: two focused on performance and two optimized for low power efficiency. When idly running on the efficiency cores, Apple says the CPU consumes as little as one fifth the energy of last year's A9. Its GPU subsystem similarly targets power efficiency, consuming two thirds the power of the A9 GPU and half as much as the A8 graphics engine used in iPhone 6. That helps contribute to the longest battery life rating ever for an iPhone: two hours longer than last year's iPhone 6s, and for the 7 Plus model an extra hour longer than the 6s Plus. That increase comes despite a boost to 3GB of RAM for iPhone 7 Plus (more SDRAM is nice to have, but also incurs a constant toll on battery life because it all has to be bathed in energy). Across three years from iPhone 5, 5s and 6, iOS has worked within 1GB of RAM. That expanded to 2GB last year on both iPhone 6s models. The increase this year indicates that Apple is confident in the overall efficiency of iOS 10 and its A10 Fusion chip, and wants to enable even more powerful software and third party apps on its top of the line 7 Plus phone. In addition to boosting the system RAM of the 7 Plus, both iPhone 7 models also double their NAND storage capacities, making 32GB the new entry point and adding 128GB and 256GB options. NAND flash memory doesn't require power to store its data, so this increase does not have a similar impact on battery life. Along with CPU and GPU cores, another significant engine built into the A10 Fusion is Apple's Image Signal Processor, which curiously doesn't get a brand name or designation such as "ISP10." It is, however, one of the most important aspects of the phones' new camera architecture, because a great deal of the improvements and capabilities of the front facing and rear cameras are delivered by this custom silicon. This offers another example of Apple's tight integration between hardware and software, as the A10's ISP is handing lots of very sophisticated hardware-accelerated processing of the digital image data flowing from the camera sensors, including what the company describes as "faster focus, and improved local tone mapping and white balance." Along with an enhanced ISP, the electronic eyes of iPhone 7 open wider to let in more light: the back camera now boasts an aperture of f/1.8 on its 12 megapixel rear camera sensor (it appears that the company has given up on calling this its "iSight" camera). The "f stop" number is the ratio of a lens's focal length to the diameter of its pupil; smaller numbers mean a bigger opening that lets in more light. The iPhone 7 rear camera also gets a new six element lens, which combined with a larger aperture, means the sensor gets up to 50 percent more light, contributing to better low light image capture. Both models also now get Optical Image Stabilization (last year, only the 6s Plus did). OIS uses micro-motors to adjust the lens position in order to counterbalance the slight movements of your hands when composing or taking a photo, leveraging the accelerometer motion sensors built into the phone. This lets the phone use a larger aperture and shoot with exposure times up to three times longer, a without suffering from motion blur. The new telephoto lens on iPhone 7 Plus uses an f/2.8 aperture for its own 12 megapixel sensor. The new dual lens system enables 2x optical zoom and progressive digital zoom levels that smoothly transfer from the standard 1x wide angle lens to the telephoto, continuing up to 6x zoom for videos or 10x zoom for still photos. 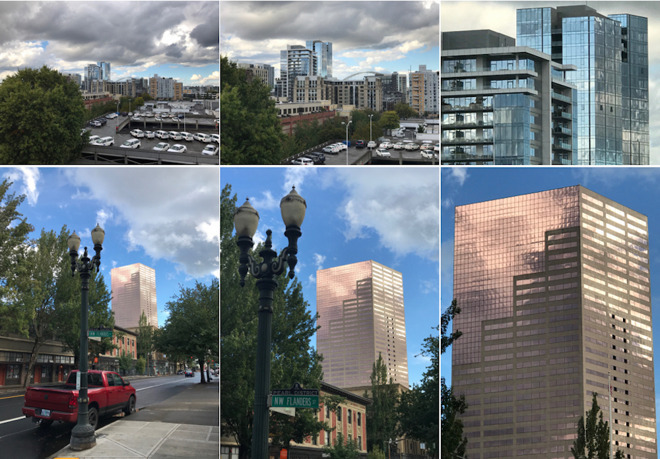 We take a closer look at what this dual lens system can do in our separate iPhone 7 and iPhone 7 Plus camera overview, but here's a taste (below) of the kinds of shots you can capture at 1x, optical 2x and up to 10x digital zoom. The front FaceTime camera on both models remains at f/2.2. The front "selfie" camera does get a bump in resolution to 7 megapixels, which is remarkably close to the 8 megapixel rear camera on iPhone 6. Just looking at the advancements in cameras and processing power, iPhone 7 offers a series of larger leaps that are greater than those introduced on the blockbuster iPhone 6. In fact, just looking at the advancements in cameras and processing power, iPhone 7 offers a series of larger leaps that are greater than those introduced on the blockbuster iPhone 6 (which paired its 8MP rear camera with a basic 1.2MP FaceTime camera, specs unchanged from iPhone 5s). Like last year, iPhone 7 captures 4K video at 30fps (in addition to 1080p video at 60fps or 30fps). You have to manually select which mode you want from Settings/Photos & Camera, as there are pros and cons to each mode. High frame rate (60fps) video isn't turned on by default because it has a hyper-realistic look to it compared to more familiar 30fps television-like video or the very cinematic feel of 24fps film. On the other hand, 4K video at 30fps is noticeably sharper in crisp detail, but quickly moving subjects often have a jittery look to them. The 4K video mode looks best when avoiding rapid panning of the camera. Despite boasting four times the pixels, 4K video only takes up about twice as much space as 1080p HD video, in part because of its lower frame rate. Unfortunately, it's difficult to share 4K (or even 1080p) videos at full quality. 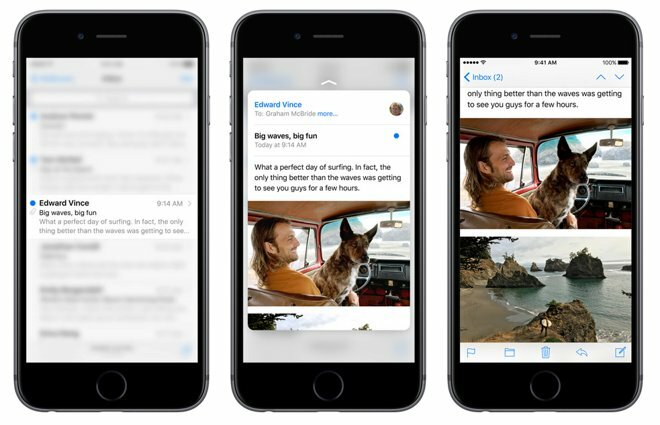 Sharing via sites like Facebook or Youtube greatly blur most of the image details away with aggressive image compression, and even sending videos from your phone via Messages or Mail to your Mac results in an automatic reduction to 720p video. It appears the only way to get full quality videos off the phone is using Apple's Photos app (or equivalent) via USB. 4K video also requires a pretty recent Mac to play back smoothly. My 2011 Macbook Air equipped with 1.8 GHz Intel Core i7 and Intel 3000 HD graphics struggles to play 4K video files that the last two generations of iPhones can play and edit smoothly. Maybe Apple's next Macs will include an A10 Fusion chip just to improve iOS captured video performance! Last year, Apple introduced Retina Flash for front facing selfie shots. Similar to the rear TrueTone flash, Retina Flash illuminates scenes based on color measurements captured by the camera module, adding a slight tinge of warmth as needed. This year, the rear TrueTone flash gets an upgrade that doubles the number of LED elements: two warm amber and two cool white. In our testing, the result is both brighter, fuller illumination of subjects when contributing a fill flash where there is already some lighting, as well as more natural, less overpowering illumination of subjects shot in full darkness. 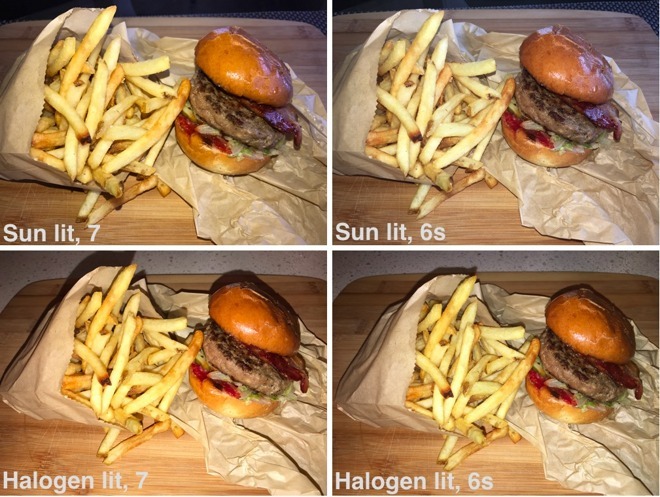 In the first two examples, our Little Big Burger & Truffle Fries were fill flashed while in natural sun lighting. 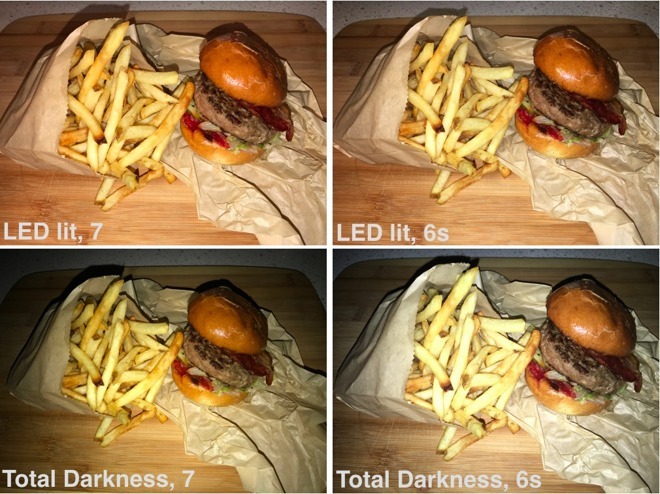 The TrueTone flash of iPhone 6s was too harsh, making the fries look bleached out, while the brighter flash of iPhone 7 retained more realistic, warmer color. Below them, a second pair of photos contrasts two scenes in warmer halogen lighting from a heat lamp, and the scene wasn't as brightly lit. There's less of a difference here, but the new 7 TrueTone flash still seems more warm and natural. Below, the top pair of images were lit by a cool LED lamp. Again, the new 7 appears to compensate with a warmer fill. Below them, a final shot was captured in total darkness. The 6s again blows out details with a colder, less flattering flash, while the 7 illuminates the scene with warmer tones and retains more detail and better color. Apple also enhanced Live Photos, which essentially captures a low frame rate video clip a second and a half before and after you snap the shutter. iPhone cameras have long captured a stream of image data when taking still photos--in order to be ready the moment you tap the shutter--but simply threw it away previously. Now, by default the video is saved along with the full quality photo. What's new is that you can now crop a Live Photo without losing the live part (both are cropped). Perhaps the weakest link in iPhone photography remains its use of tiny plastic lenses. Light refraction, lens flares and bright point artifacts continue to be a problem on iPhone 7, and won't go away until Apple decides to improve upon its lens, ideally including some sort of option for supporting external lens attachments for specialty lenses. When launching iPhone 7, Apple gave short shrift to its decision to drop the analog headphone jack, focusing instead upon its proposed alternatives. It ships with Lightning earbuds (which to me sound identical to the previous analog jack version, whether used with iPhone 7 or a previous model) but Apple is really betting that users will make the leap to wireless headphones. It has created its own wireless AirPods (which won't be available until October), and its Beats subsidiary now has three families of wireless headphones to choose from. 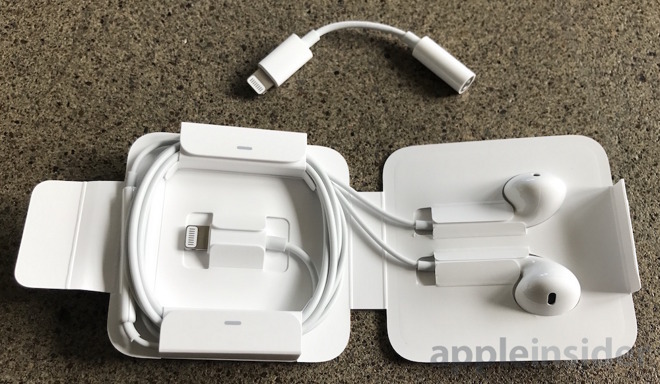 If you stay wired, you can use Apple bundled earbuds or use other corded headphones with the supplied Lightning to minijack connector, but you can't charge and listen at the same time without using a Dock, or getting a third party splitter cable. Apple sells a series of color-matched $49 iPhone 7 Lightning Docks so you can charge and sync while using auxiliary audio cables or wired headphones. However, Apple has invested in a wireless future where Ethernet and Firewire cabled networking were sacrificed in favor of wireless WiFi and peripherals ideally prefer Bluetooth over USB. Pushing audio distribution to Bluetooth (or WiFi AirPlay distribution) is just the next step in that transition. Despite much gnashing of teeth, there are serious benefits of wireless headphones, mostly having to do with not having to deal with wires. While we'll look closer at AirPods when they arrive, it's also interesting that Apple has loaded them up with sophisticated optical sensors and accelerometers to enable them to use beam-forming to focus on your voice, essentially being the second connected, wearable peripheral after Apple Watch. iPhone 7 models also introduce new built-in stereo speakers, one in the base and the other in the earpiece. This generates twice the volume for listening to music, watching videos, playing games or using on speakerphone. Its built-in audio is comparable to using a basic external Bluetooth speaker, meaning you can now play casual music at a picnic or on the beach without packing a separate speaker. The sound quality is good but certainly a bit short of spectacular, given that it uses such small speakers. It's very usable, although I felt like the sound is a bit too crisp. I haven't used audio EQ controls in so long I forgot where they were in iOS. There is nothing in Settings / Audio for adjusting system sound, but you can adjust EQ settings for Apple Music. The "Small Speakers" setting seemed to result in impressive sound given that its coming from an iPhone. Apple is supporting 23 LTE bands worldwide, making it adept at global roaming. If your carrier supports LTE Advanced, the new 7 models can support insane mobile speeds of up to 450Mbps (standard LTE service typically tops out around 40Mbps, with Wideband LTE offering as much as 150Mbps service, where available). Of course, this new technology only helps if your carrier supports it. In the U.S., AT&T has been deploying LTE Advanced networks in a series of cities and Verizon now claims LTE Advanced coverage in "more than 450 cities," although neither make any promises about actual throughput speeds. Even solid 40Mbps LTE service delivers a spectacular experience for mobile users browsing the web and downloading music. 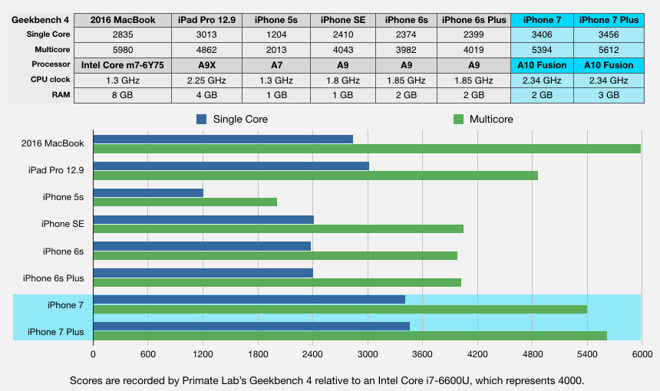 iPhone 7 continues to support the same WiFi spec as iPhone 6s: 802.11ac (the latest standard used in Apple's tall form factor AirPort and Time Capsule base stations, newer Macs as well as a variety of third party WiFi base stations) with multiple antenna MIMO technology that supports wireless speeds of up to 866MHz, twice the maximum of iPhone 6. Taking advantage of these faster speeds does require an 802.11ac network. If you're connecting at Starbucks or using the same home router you bought several years ago, your WiFi speeds will likely be limited to 802.11n (150Mbps) or the older 802.11g (54Mpbs) or perhaps even slower. 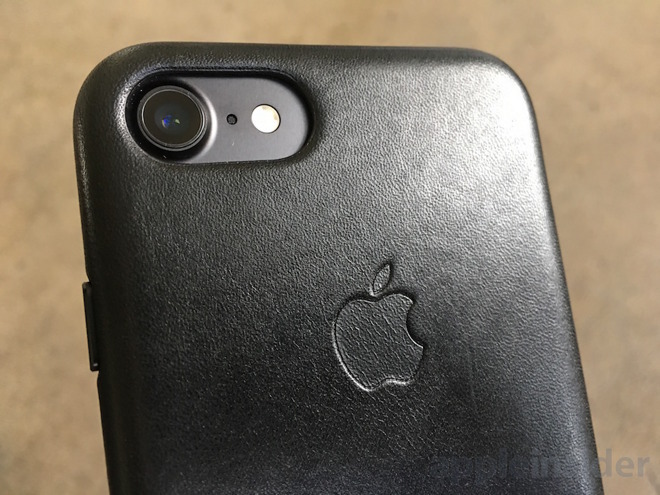 Apart from their larger camera bumps, the new iPhone 7 and 7s Plus don't look very different externally outside of the two new Black and Jet Black finishes and the repositioned antenna seam lines that look more sophisticated (that is, less like underwear). They continue to use the same "7000 Series Aluminum" high strength alloy Apple proclaimed to be "the best it has ever used in an iPhone" last year. That's also the same material the company uses in its aluminum Apple Watch models. Apple has also improved upon the rubber seals and gaskets in the case itself and around connectors inside the device that it began using last year, upgrading iPhone 7 models to a full IP67 rating for dust and liquid intrusion resistance. Last year, based on the experience in using Apple Watch in and around water, we observed that "it looks like within a year or two we could be just as casual about exposing our iPhones to water." It's cool to see that's already here. You can actually now film underwater if you so dare, although the water resistance rating indicates you shouldn't expect to get it more than a bit wet in shallow water. Water is heavy, and so the pressure on seals goes up rapidly the deeper you take your phone into a pool. It's not for swimming and taking underwater snorkeling pics; for that I'd recommend using a water tight case. Also remember that a capacitative screen doesn't work when wet. 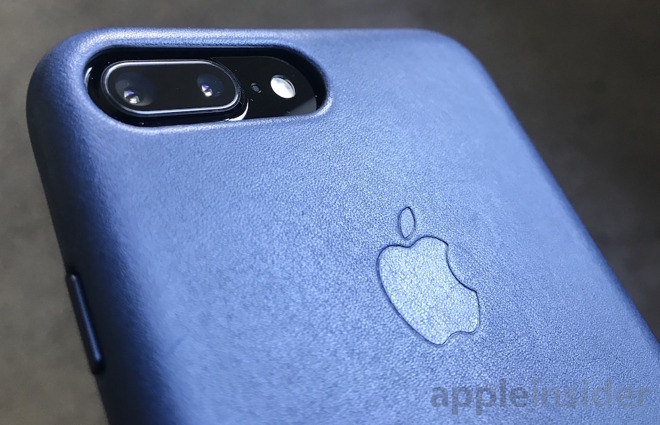 Apple has also enhanced its own set of leather covers with more substantial plastic side button covers, versus the simple leather perforation lines on earlier generations that made hitting the volume or wake buttons feel mushy. The new solid caps integrated into the leather covers feel more like you're using the phone without a cover in the way. 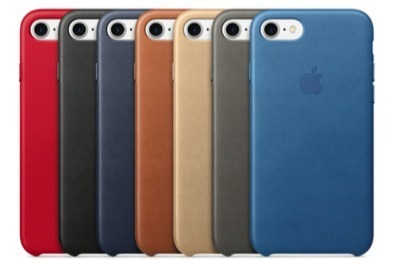 In addition to the Black and Midnight Blue leather cases pictured above (the blue looks lighter here than it actually is due to the highlight), Apple also offers its $45 leather case in a lighter Sea Blue and Storm Grey, as well as a creamy light Tan, a roasted bean Saddle Brown and a brilliant (Product)RED. While the new iPhone 7 models now sport an IP67 water resistance similar to the original Apple Watch, its natural leather covers are not impervious to water damage and will scuff up faster if you get them wet. Wet leather also feels kind of slimy until it dries out. 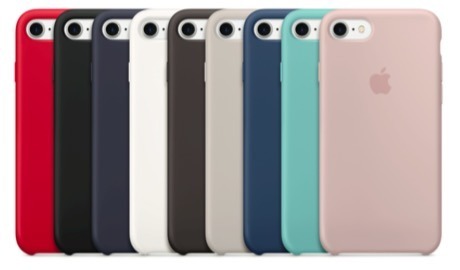 Apple also offers a $35 Silicone case with a rubbery, grippy feel that shouldn't have any problem getting wet. It's available in Pink Sand, a more teal Sea Blue, a pastel Ocean Blue, a nearly black Midnight Blue, an off-white Stone, a bright White, solid Black, a chocolatey Cocoa and the very bright (Product)RED. Apple also continues to offer its $99 Smart Battery case, in black or white, exclusively for the standard iPhone 7 model. It gives the phone a bump on the back in exchange for extending battery life for up to 26 hours of talk time. One year after delivering the "nothing new but everything" iPhone 6s, Apple is back with a new generation that's even more sophisticated, powerful and efficient, sporting a variety of features that were once only available if you gave up your iOS apps and defected to the more basic world of Android, where nothing works quite as smoothly and software updates end before your mobile contract does. With weatherproofing, a much nicer display, better speakers and enhanced cameras (and the new dual 7 Plus lens), Apple has effectively erased the primary reasons to even consider a high end alternative smartphone. At the same time, Apple's silicon savvy continues to lead the industry in performance and battery efficiency, making iPhone 7 fast and fluid while also being light and thin. If you already have an iPhone 6s, the extra speed, camera features and water resistance may dangle a tantalizing upgrade opportunity that's too hard to resist, particularly given the relatively high resale value of old iPhones. If you have an older phone, the great deals and upgrade incentives many carriers are competing to offer make the new iPhone 7 a no brainer upgrade. Or check out our trade-in guide for cash payout values that can be applied to purchasing an iPhone 7. A harder choice is the option between the more compact and easy to pocket standard model, and its larger, heavier Plus edition with a larger screen, more RAM and the new dual camera system. We will take a closer look at the differences between the two sizes in an upcoming feature.